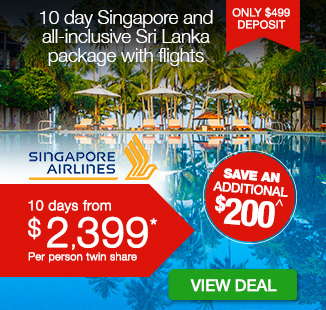 Including return Singapore Airline flights, all accommodation, delicious daily breakfast, jeep or elephant ride in India, jeep safari in Sri Lanka, small group tour experience, and more. Take in the diverse cultures, sights and experiences offered in two of the world’s most exciting holiday destinations with a 14 day Taste of India and Sri Lanka tour. Your first taste of this extraordinary trip comes from Delhi. The frenetic capital of India may feel like another world upon arrival and a full-day of sightseeing will introduce you to its charms. Learn about the city’s Mughal heritage at the Red Fort, take in the heady scent of spices and herbs from the market stalls at Chandni Chowk, and admire the design of Humayun’s Tomb – the building said to have inspired the Taj Mahal. 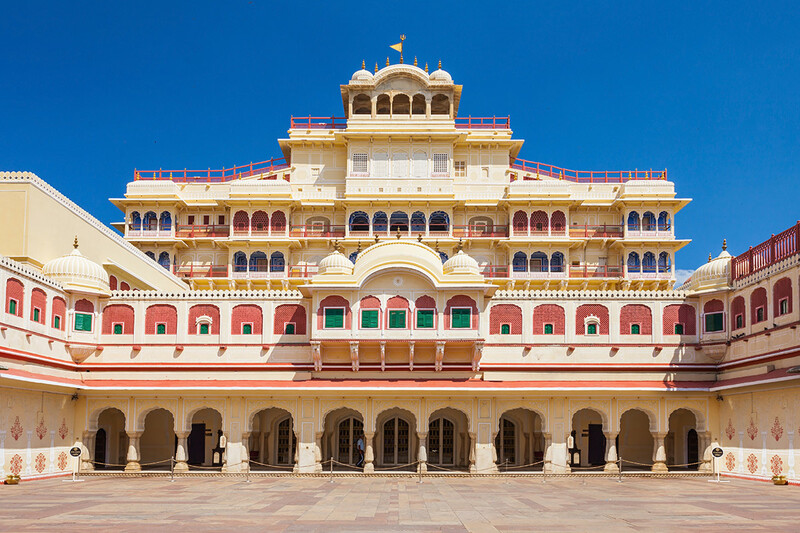 Continue your discovery of India in Jaipur, a destination aptly dubbed the Pink City, as you see its City Palace, Hawa Mahal and nearby Amer Fort. A bucket list experience awaits in Agra, the city home to one of India’s most iconic structures: the Taj Mahal. 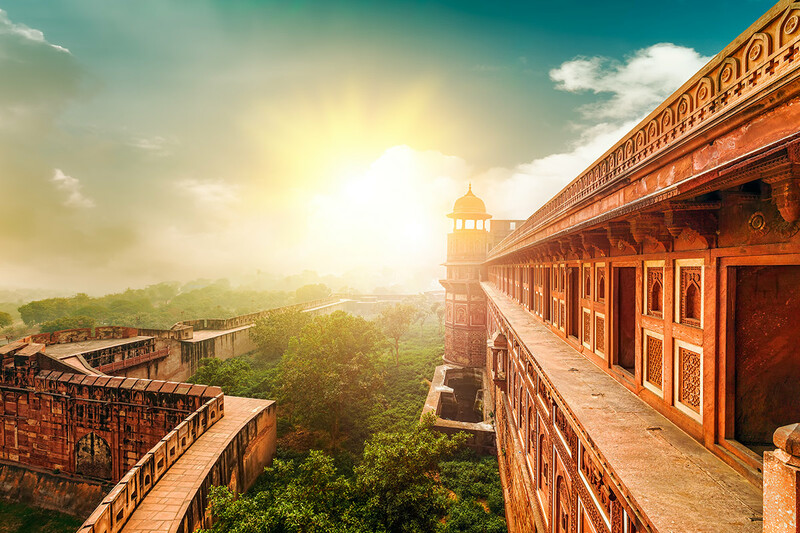 Wake early to be in awe of sunrise at this marble-clad monument, and then travel just down the road to Agra Fort to explore its collection of former royal residences and buildings. Fly from India to Sri Lanka and prepare to discover why this isle is topping travellers’ must-visit lists. Uncover the heritage of Colombo on a guided sightseeing tour and gain insight into the English, Dutch and Portuguese influences that can still be seen and felt around the Sri Lankan capital. Venture into the central provinces and head underground as you take in the depictions of Buddha adorning the cavernous network at Dambulla Cave Temple. 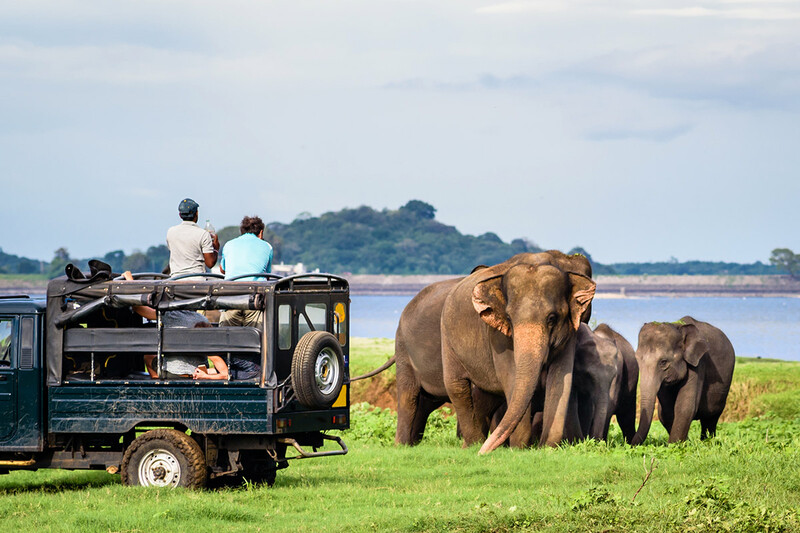 Climb to the remains on an ancient royal palace atop Sigiriya and encounter wild free-roaming elephants and other wildlife on a jeep safari adventure across the plains of Minneriya National Park. 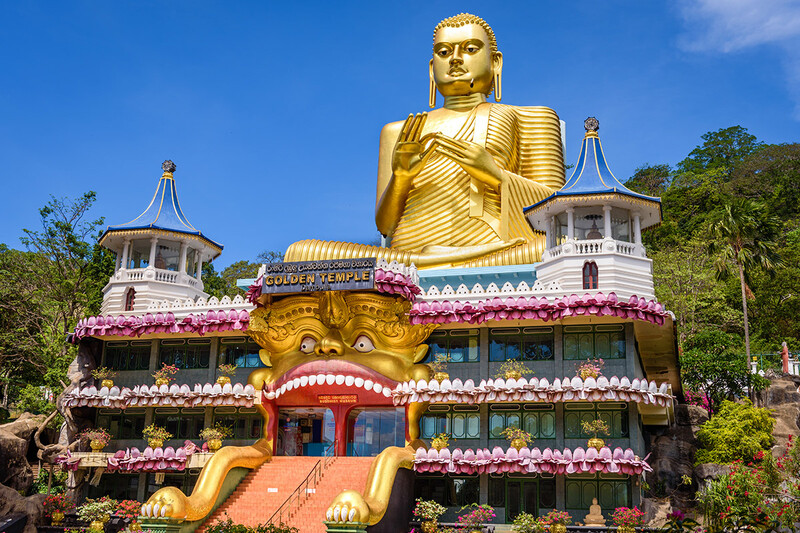 Visit one of the most revered sites in Sri Lanka at Kandy’s Temple of The Sacred Tooth, and make for the lush surrounds of tea plantations, mountains and valleys of Tea Country. 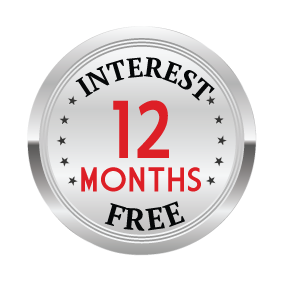 Want to experience more of India? Opt to extend the itinerary to an 19 day experience to include time in Varanasi. Board your Singapore Airlines flight to India and land in Delhi. You will be met upon arrival by a tour representative, who will assist with hotel transfers. Your first full day experience the sights and sounds of India! Begin with a jam-packed day of sightseeing around this buzzing city. 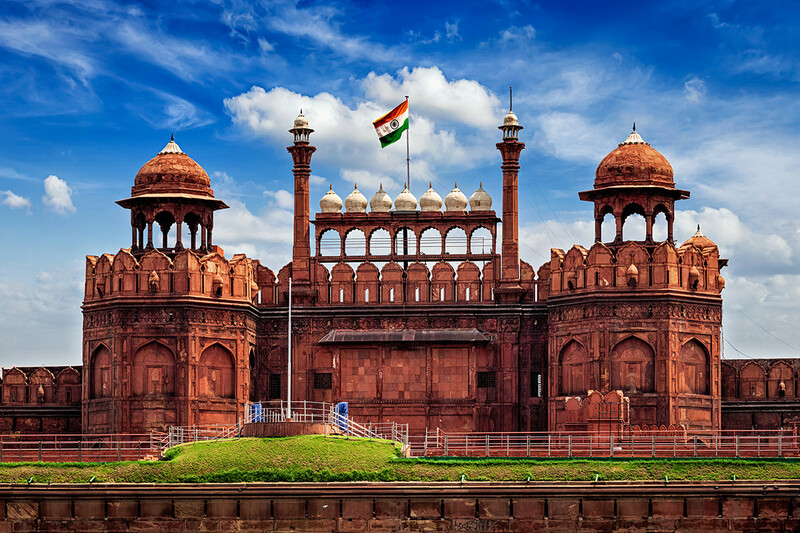 The first stop on the itinerary is Red Fort, a former royal residence for Mughal emperors. It is then onto Jama Masjid, the largest mosque in India. Be sure to climb up to the top of the southern tower for sweeping views of Delhi’s Old City. Continue to Chandni Chowk, a chaotic and exciting local market, and Qutab Minar and Humayun’s Tomb. Other stops today include Lotus Temple, India Gate and the war memorial. Make the move from Delhi to Jaipur this morning; a journey that takes about six hours. 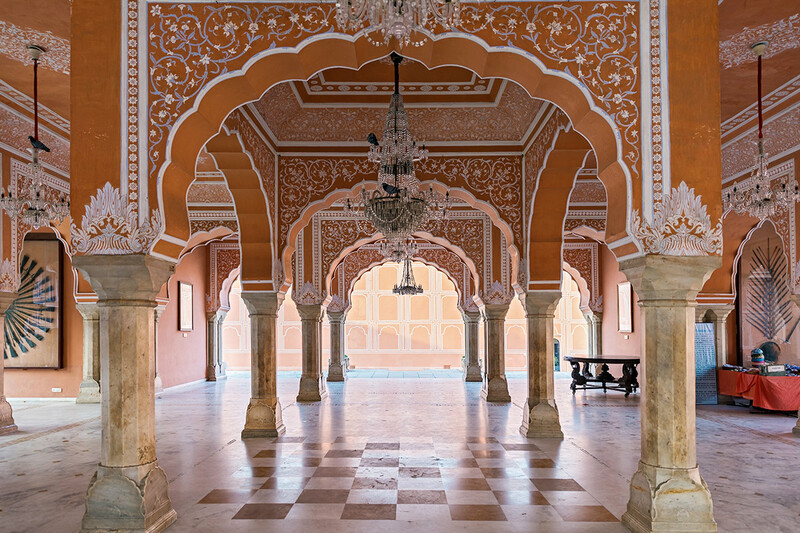 Upon arrival in the Pink City you will see some of its most frequented landmarks, including City Palace, Jantar Mantar and Albert Hall Museum. 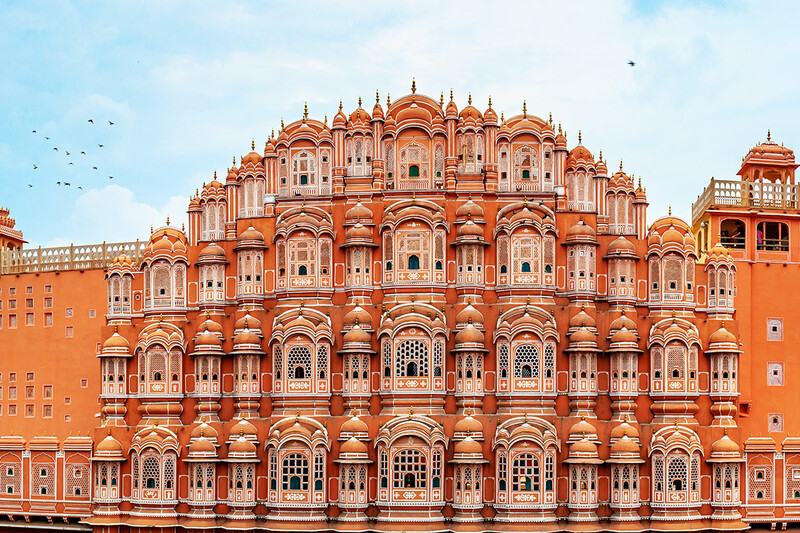 An early morning wake-up call has its rewards once you see the morning light hitting Hawa Mahal, a striking site also known as the Wind Palace. Hawa Mahal is particularly known for its unique honeycomb-esque design; a feature that makes it a superb photography subject. The group then drives out to Amer Fort, the commanding clifftop fortress located just outside the main city. A jeep or elephant ride takes you into the fort’s inner courtyard and from here you will be able to take in the expansive views across the surrounding countryside. There is a stop at Jal Mahal, a smaller palace located in the middle of Man Sagar Lake, and then a block-printing workshop on the return journey to Jaipur. Leave Jaipur for Agra. To break up this five-hour drive is an enroute pitstop in the village of Abhaneri, the location of Chand Baori, a stepwell built more than 1000 years ago. The village is also home to Harshat Mata Temple. The group arrives in Agra in the afternoon. You will never forget the first time you lay eyes on arguably the most famous monument in India: the Taj Mahal. Rise before dawn so you can watch sunrise over this marble-clad wonder, a mausoleum built by Shah Jahan upon the passing of his favourite wife, Mumtaz Mahal. You will have time to roam the beautifully-manicured (and perfectly symmetrical) gardens and take photos of the majestic Taj Mahal from every photogenic angle. The group returns to the hotel for breakfast and check out before it is onto Agra Fort. This red-hued fortress is another grand example of Mughal architecture and was also where Shah Jahan was later imprisoned by his son. Your final stop in Agra is Itmad-uh-Daulah, the first tomb in India to be made completely from marble. The group then sets out on the return drive to Delhi, a trip that takes about five hours. Enjoy a farewell dinner with your fellow travellers when back in the capital and also receive a group photo momento as a souvenir of your experiences in India. Please note that the Taj Mahal is closed on Fridays. Should Day 6 fall on a Friday, the group will head to the Taj Mahal for sunset on Day 5. A transfer takes you to the airport in Delhi and you will board a one-way flight to Sri Lanka’s capital city, Colombo. You will be met upon arrival and transferred to the Colombo hotel for check in. A sightseeing tour this morning introduces you to some of Colombo’s best sites and is your opportunity to learn about the city’s British, Dutch and Portuguese heritage. The tour then journeys to Dambulla Cave Temple. This network of caves is made up of five cavernous spaces that are adorned with almost 150 statues and depictions of Buddha. 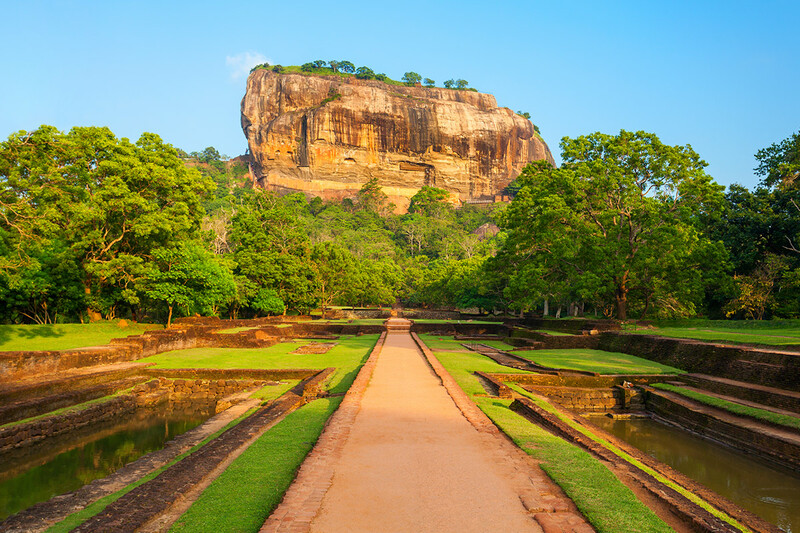 Take up the opportunity to climb Sigiriya Rock Fortress, a site known as Lion’s rock or the ‘Fortress in the Sky’ that also happens to be one of Sri Lanka’s most recognisable natural landmarks. The ascent to the summit offers the chance to see the remains of an ancient royal palace and the gardens that once occupied the top of this behemoth boulder. The next stop for today is Minneriya National Park where you will experience an exciting jeep safari through this protected reserve. As well as its various other four-legged and furry occupants, such as leopard, spotted deer, crocodile and wild buffalo, the park is particularly known for its herd of elephant and the subsequent elephant gathering. The gathering is a natural phenomenon that occurs large herds of pachyderms gather around a central water source during the dry season. Today takes you from Sigiriya to Kandy, however not before a visit to Matale along the way. This enroute pitstop will see you explore a organic herb and spice plantation. Lunch is also taken at the plantation. Arrive in Kandy and immediately head out into this old ancient capital on a guided city tour. 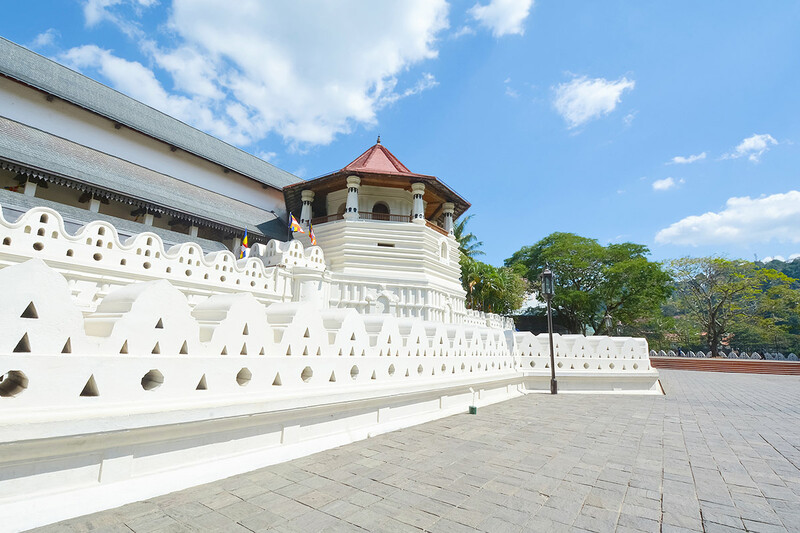 Of course, the tour will take you past the Temple of the Sacred Tooth Relic. This temple resides within the grounds of the former royal palace and is believed to house the relic of one of Buddha’s teeth. This artefact is one of Sri Lanka’s most treasured artefacts and draws in crowds of locals and tourists alike. Travellers have the option of enjoying a cultural show this evening. 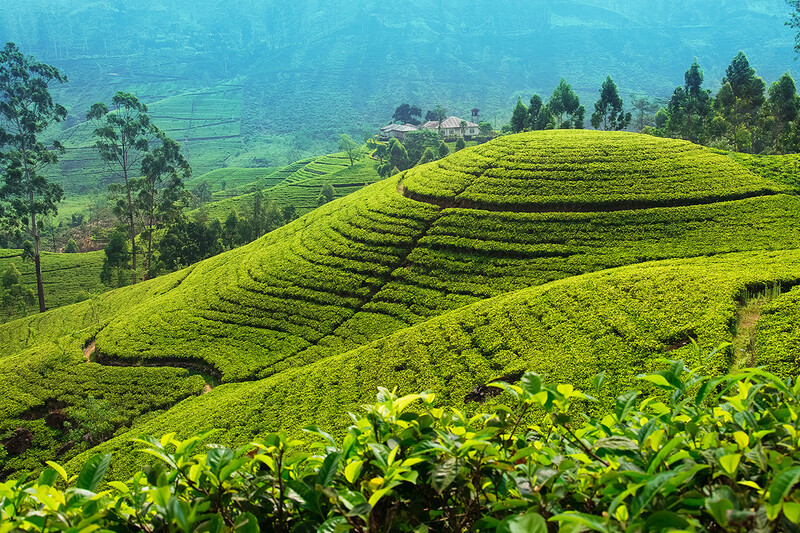 Venture into Sri Lanka’s lush Hill Country today, making for the town of Nuwara Eliya. Take in the decidedly British feel of this idyllic town and appreciate its beautiful surrounds of mountains, valleys, tea plantations and waterfalls. Make a stop in Kitugala, one of the filming locations used in the production of The Bridge on the River Kwai, as the group travels to Negombo. There is opportunity to explore Negombo’s house-lined canal, souvenir ships, restaurants and streets when you arrive in the city, located north of Colombo. Take the airport transfer in order to board your return flight to Australia. Your first full day experience the sights and sounds of India! Begin with a jam-packed day of sightseeing around this buzzing city. 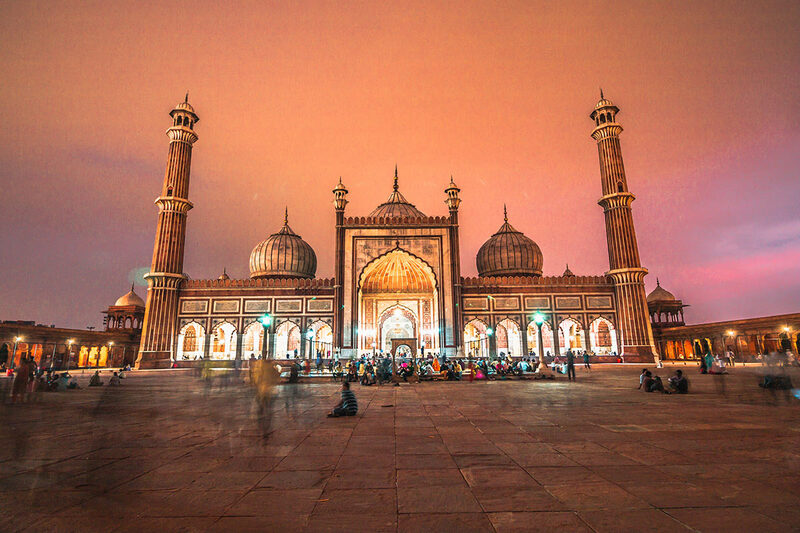 The first stop is Jama Masjid, the largest mosque in India. Be sure to climb up to the top of the southern tower for sweeping views of Delhi’s Old City. Continue to Chandni Chowk, a chaotic local market brimming with stalls selling spices, herbs and other goods. The final stop of the day is the Red Fort, a reminder of the city’s Mughal emperors and one of Delhi’s most visited sites. Return to the hotel by Delhi metro. Make the move from Delhi to Jaipur this morning, a journey that takes about six hours. 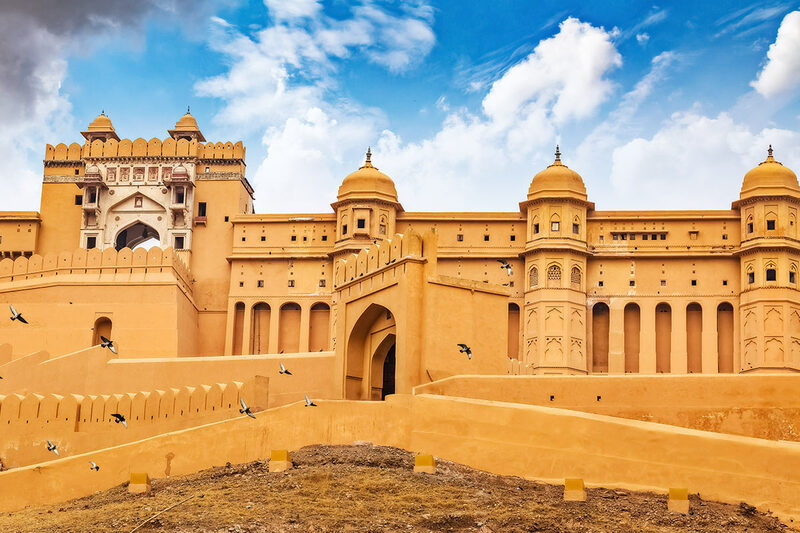 Upon arrival in the Pink City you will see some of its most frequented landmarks, including the sprawling City Palace, which covers one seventh of the Old City area. Other sites to see in Jaipur are Jantar Mantar and the Albert Hall Museum. Leave Jaipur for Agra. To break up this five-hour drive is an enroute pitstop in fortified city of Fatehpur Sikri or the village of Abhaneri, the location of Chand Baori, a stepwell built more than 1000 years ago. The group arrives in Agra in the afternoon. You will never forget the first time you lay eyes on arguably the most famous monument in India: the Taj Mahal. Rise before dawn this morning so you can watch sunrise over this marble-clad wonder, a mausoleum built by Shah Jahan upon the passing of his favourite wife, Mumtaz Mahal. 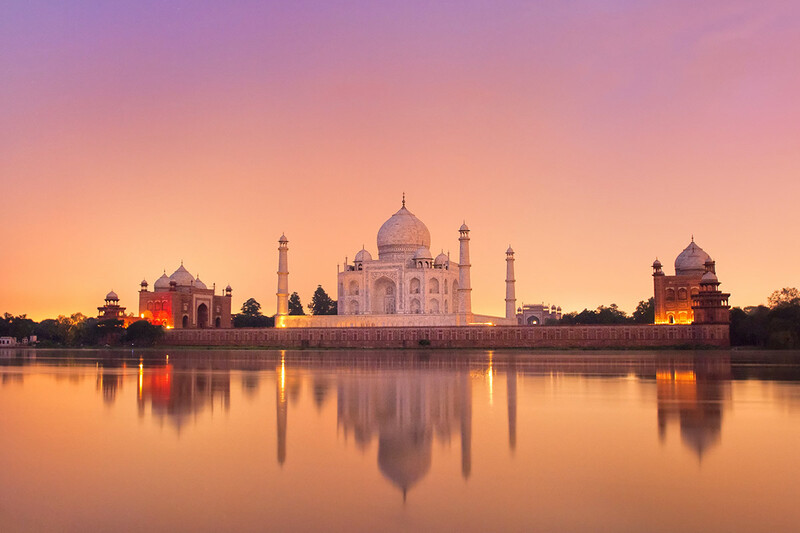 You will have time to roam the beautifully-manicured (and perfectly symmetrical) gardens and take photos of the majestic Taj Mahal from every photogenic angle. The group returns to the hotel for breakfast and check out before it is onto Agra Fort. This red-hued fortress is another grand example of Mughal architecture and was also where Shah Jahan was later imprisoned by his son. Your final stop in Agra is Itmad-uh-Daulah, the first tomb in India to be made completely from marble. Take a flight to Varanasi. You will be met upon arrival and assisted with a hotel transfer, so you can check in and settle into your room. In the afternoon, join a sightseeing tour of the city’s Old Town from aboard a rickshaw. Varanasi is situated along the banks of the revered Ganges, is steeped in spirituality (it is one of the holiest locations in India) and is brimming with temples, shrines, bathing ghats and devotees embarking on pilgrimages. Some of the highlights from the tour include Annapoorna Devi temple, Assig hat, Bharat Mata Temple, and Dashaswamedh ghat. This evening the group returns to the banks of the river to watch a Ganges Aarti ceremony. See the four-kilometre stretch of ghats lining the Ganges with a morning boat ride along the river. This excursion offers a unique perspective into how these bathing ghats feature in the daily lives and devotions of locals and pilgrims. Please remember to be respectful if taking photographs. You will also pass the burning ghats where cremations are held. Return to the hotel for breakfast and some free time. Then, in the afternoon, reconvene with the group for a visit to Banaras Hindu University, the largest residential university in Asia with more than 30, 000 students. While in Varanasi there is also opportunity to see Sarnath, the location where Lord Buddha delivered his first lecture after attaining nirvana. Sarnath has a handful of temples and museums to explore and is located just outside Varanasi. A transfer takes you to the airport for a flight to Delhi. You will be met upon arrival and transferred to the hotel. Welcome back to Delhi! Today, see a different side of the Indian capital with a guided tour around some New Delhi’s sights. Look up at Qutab Minar, the tallest brick minaret in the world and a glorious example of Indo-Islamic architecture. It has been standing since 1206, yet the reason behind its construction still remains unknown. Check out Humayun’s Tomb, a site said to be the design inspiration behind the Taj Mahal. Admire the Bahai Temple (Lotus Temple) and then see India Gate and Laxmi Narayan Temple. The day concludes with a farewell dinner, enjoyed with your fellow travellers. You will also receive a group photo as a keepsake momento of your time in India. Board a one-way flight that takes you from India to Sri Lanka, landing in the latter’s capital city of Colombo. A transfer will greet you upon arrival and help with your hotel transfer. Make a stop in Kitugala, one of the filming locations used in the production of The Bridge on the River Kwai, as the group travels to Negombo. There is opportunity to explore Negombo’s house-lined canal, souvenir shops, restaurants and streets when you arrive in the city, located north of Colombo. 2019 and 2020 travel dates available! Documentation will be provided after final payment is complete and within 30 days of travel, including E-Ticket instructions, hotel confirmation, itinerary extension & optional tour confirmation (where applicable) and destination travel tips. 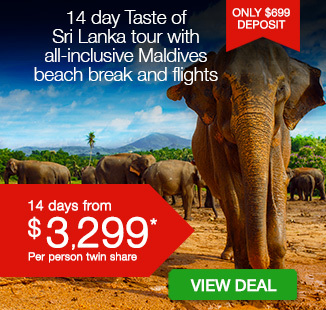 14 day tour – $699 per person in addition to the twin share price. 18 day tour – $999 per person in addition to the twin share price. Tour Only: To purchase this tour without the return international flights, click here. By selecting this option, you will also forfeit the flight from Delhi to Colombo and all airport transfers (if applicable) will be forfeited. Please note, 18 day itinerary will include return internal flights from Delhi to Varanasi with the tour only option. Bedding configuration: 1 x king or 2 x single beds. If your flight variation incurs additional airfare and taxes, a request for payment will be sent via email. If payment is not received by the date and time advised, Webjet Exclusives will proceed to book flights as per the dates of the tour.